Kpop seems to be experimenting with some island rhythms as Reggae inspired beats continue to hit the Kpop scene. I haven’t been around Kpop as long as some, so I don’t know the whole history of reggae in the Korean music industry, but I have noticed that recently a few of your favorite Kpop artists are trying their best to get their skank on. In 2008, Skull left to perform his two years of military service and Kush stayed with YGE to become a composer as many of you well know. And from there Stony Skunk became no more. I don’t claim to be any kind of reggae expert, but in Hawaii reggae is popular and we even have our own subgenre of Hawaiian/Reggae music called “Jawaiian” so I’m familiar with reggae. While this remix of 2NE1’s song had the requisite syncopated beats of reggae music, there was just something about it that just didn’t mesh so well in my opinion. It didn’t help that the bass sounded flat, but I think the singing style didn’t match and the brass lines were more big band than reggae to me. I loved the song and dancing, but this wasn’t reggae at all to me. I think the main reason was because the rhythm of the song had your standard beat instead of the syncopated reggae beat. The song styling could possibly fall under one of the reggae subgenres like Dancehall, Ragga, or Reggaeton, but I guess I’m old school when it comes to reggae so for me, it’s just not reggae. Recently 2NE1 and YGE dabbled again in the reggae genre with a reggae remix of their latest hit song “Lonely.” In my opinion, it’s a much better reggae remix and they brought in some of Korea’s top musicians to jam with them, check it out. The music here definitely has more of your standard reggae beats, though it’s pace is still a bit upbeat for reggae which makes me think it might be more Ska or Rocksteady. The difference between the three genres is slight and even when doing some research into the differences and watching an expert explain the differences between the three… I’m still unsure. I do have to say one thing about these Kpop forays into the reggae genre, while not all the attempts were successful in my opinion, I appreciate the effort. It’s like Minzy said in the video: it’s a way for these artists to reach out to their fans “in diverse and fresh ways.” It’s introducing the young fans of these groups to a whole other world of musical expression. It also incorporates the use of more actual instruments and the musicians who play them instead of relying so much on synthesizers. If there’s one thing I do appreciate in the ofttimes bubble gum world of Kpop it’s an artist that continues to try to improve and show growth in their work, especially when a lot of others continue to churn out the same old manufactured formulas that they stick with as long as it continues to make them money. In recent Korean reggae news, the aforementioned former member of Stony Skunk, Skull, has released his comeback song after a three year absence and under a new label after leaving YGE. The song is “Don’t Walk Away” and features Jamaican reggae artist Spragga Benz. This is more of what I know as reggae. The song has a great beat, Skull’s lyrical flow is smooth and he has a distinctive raspy quality to his voice that definitely meshes well with the reggae genre. Some of the pronunciation of the English lyrics are a bit off, but with reggae the pronunciation is often slurred so it’s pretty moot. Skull had previously hit it big as a solo artist in June of 2007 when his solo version of “Boomdi Boomdi” hit #10 in the US Hot R&B/Hip-Hop Singles Sales Charts. 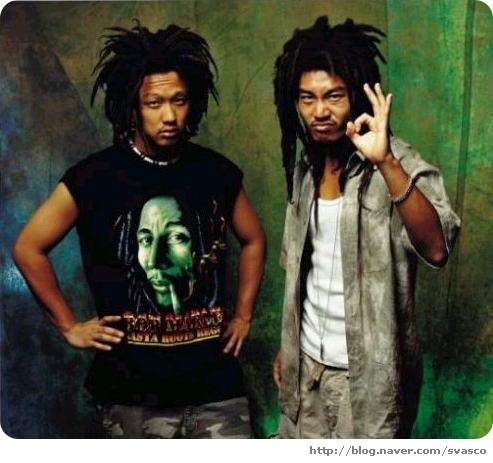 His new album Korean Reggae will also feature the likes of Rohan Marley, son of Bob and ‘husband’ of Lauryn Hill, and will be released on June 1st. Skull plans to promote the album in Korea, Jamaica, and the US.